Titan, the only major body in the solar system that we haven’t gotten a good look at, is about to be outed. MOST OF US PROBABLY FEEL THAT WE SPEND LONG, tedious intervals in the shadows awaiting brief moments of glory. But spare a thought for the European Space Agency’s Huygens planetary probe. After a seven-year cruise through space, the 700-pound disk, stuffed with electronic instruments, will spend as little as three minutes on the surface of Titan, the largest moon of Saturn. Then it will either sink beneath a burbling methane ocean or be abandoned in frozen Titanic wastes forevermore. And that’s if everything goes well. Yet Huygens and its ground controllers in the German suburb of Darmstadt will in those three minutes see what no one has seen before. Titan, which is larger than Mercury and almost half the size of Earth, is surrounded by a dense gaseous atmosphere that has kept its surface hidden—from the Voyager probes, which flew by in 1980 and ’81; from the Hubble Space Telescope, which measured the moon’s surface reflectivity in 1994; and from the cloud-penetrating radar of the Arecibo Observatory in Puerto Rico, which in 2001 and 2002 detected glints from Titan’s radar-reflective areas. To know the surface of Titan, scientists must send an observer to descend beneath the atmosphere. ESA’s Huygenauts don’t even know if their vessel will land on a hard surface or liquid; they figure the chances for either at 50-50. The Huygens project—named for Christiaan Huygens, the Dutch astronomer who in 1655 discovered Titan—is something of a pioneer back on Earth too. It is Europe’s farthest stab by far into the universe. It is also the first spacecraft of any country to attempt a landing—hairsplitters would say an “impact”—in the outer solar system. “By the time we get the first pictures, we will have either succeeded spectacularly or failed spectacularly.” So concludes David Salt, one of two British techies minding Huygens’ so-far quiescent bank of computer monitors in a bunker-like control room in the Darmstadt basement. Either way, it will be too late to do anything about it. With Huygens 80 light-minutes from Earth (compared to nine for the Mars landers recently in the news), a round-trip radio signal, even assuming it penetrated the Titanic haze, would take longer than Huygens’ planned 150-minute plunge through the atmosphere. The little craft—all of eight feet in diameter and looking Star Wars-adorable hunkered behind a cap-like heat shield—will be alone in the impenetrable fog of strange and complex hydrocarbons. At about 200 miles above Titan’s surface, the heat shield will brake the craft from 12,400 mph to 870 mph in less than two minutes. Sensing the reduced speed, accelerometers on board should trigger the release of the first of three parachutes, meant to slow the craft to about 12 mph so its impact with the surface will be survivable. When the first chute deploys and the shell is jettisoned, the science instruments kick in, and the distilled genius of another pint-size explorer—the European Space Agency, which figures its budget at six percent of NASA’s—goes to work. ESA has had help. Plenty of American know-how is at work on Huygens too. For one thing, the probe is hitching a ride to Saturn on a NASA spacecraft named Cassini (after Renaissance Italian skywatcher Gian Domenico Cassini, who discovered one of the gaps in Saturn’s rings). Cassini will begin to orbit Saturn on July 1 and, sweeping by Titan with its infrared camera and radar, will upstage Huygens with the first glimpses of the moon’s surface. Six and a half months later, Cassini will drop Huygens off to visit Titan, relay (it is hoped) Huygens’ data feeds, then head off on its own four-year tour of the ringed planet. Huygens carries a transatlantic suite of instruments. An Aerosol Collector and Pyrolyzer, built in Paris, will grab samples of Titan’s atmosphere during descent, vaporize them, and feed the results for analysis to a spectrometer constructed at NASA’s Goddard Space Flight Center in Maryland. The Italian-made Huygens Atmospheric Instrument, which senses lightning and other electrical activity in the moon’s sky, works with a Descent Imager and Spectral Radiometer (that is to say, a camera and radiation sensor), contributed by the University of Arizona. Astronomers have argued about the surface of Titan since the 1970s when they found evidence of a thick cloud deck in its atmosphere. Data from the Voyager spacecraft in 1980 spurred the theory that Titan was all one great methane ocean, but near-infrared observations by the Hubble telescope in 1994 showed dark and light patches, indicating a mix, but not revealing what was producing the differences: Continents? Oceans? Craters? One prominent surface feature in the Hubble images is a bright area about the size of Australia. Huygen’s landing site is on the Titan equator west of the feature, in a dark area. So if it survives its descent through the atmosphere, what might the little probe see? “Almost certainly craters,” says Jonathan I. Lunine, a Huygens scientist with the University of Arizona. “Maybe interesting and exotic landforms and erosional features.” Other scientists have suggested mountains covered in methane snow. Lebreton says he would rather Huygens come down in a methane lake. Amid all the wizardry of sending robots to Saturn, his reason is comically simple. If the capsule hits solid ground, the impact might topple it, pointing its antenna away from Cassini and sending its transmissions into empty space. If it lands on liquid, Lebreton says, Huygens should float for five to 10 minutes, and for at least three of those precious minutes, its batteries will continue to power transmissions. In the ideal scenario—Huygens on land and upright after a fast descent—the transmission window could be as long as two hours before the mothership and its receivers disappear beneath Titan’s horizon. But Lebreton, who started working on what would become Huygens in 1984, would rather take his three minutes guaranteed. As he approaches the spectacular climax of his career, Lebreton worries about more than Huygens tipping over. ESA is still coming to grips with the failure of another planetary lander, Beagle II, which last Christmas disappeared inexplicably during its descent to Mars. European cosmocrats are at pains now to distinguish Huygens from Beagle. The Mars craft was a shoestring adventure, they say, built for $80 million. It was built with partial funding from private U.K. companies, and its operational headquarters was at England’s Open University in Milton Keynes, north of London. Huygens, adequately funded at $400 million, was incubated and bred at ESA’s own scientific center, a sprawling campus-like complex tucked behind the North Sea dunes at Noordwijk, in the Netherlands. Huygens ran into a serious problem all its own in February 2000, when a semi-annual systems checkup revealed that its communications with Cassini were garbled. Diagnosing the fault was relatively simple: The receiver that ESA had installed on the mothership had not been designed to cope with the extreme Doppler shift in radio frequencies that would occur after the probe separates from and transmits its data back to Cassini. Fixing it, on a spacecraft cruising around the solar system, was anything but simple. 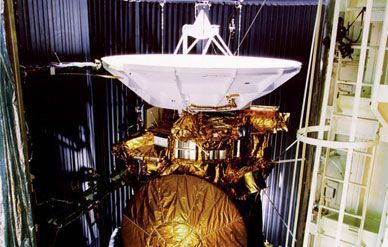 With Cassini-Huygens well beyond repairman range, the only solution left was to attempt to reduce the Doppler shift so that the transmitted signals would fall within the receiver’s designed bandwidth. That required ESA and NASA’s Jet Propulsion Laboratory in southern California to remap much of the Saturn mission, so that Cassini would be moving past Titan on the right track to receive the data transmitted from Huygens. The long-distance adjustments took three years, as the two mission controls modeled possible trajectories, then programmers furiously wrote software instructing the spacecraft in their new routines. Huygens will now disengage from Cassini on the mothership’s third pass by Titan after entering orbit around Saturn. That will happen this December 25, about six weeks later than originally planned. At the time of separation, both craft will be on a course to collide with the moon. The lander will coast another 2.5 million miles to do just that, but five days after the separation, Cassini will fire maneuvering thrusters—“slam on the brakes,” as deputy program manager Earl Maize puts it—to change course and orient itself so that when Huygens starts transmitting, Cassini’s high-gain antenna will be pointed toward Titan. The success of the Huygens mission depends on this maneuver. In the meantime, Huygens will sleep until an onboard timer, set at separation, wakes up the craft’s batteries and computers as Huygens approaches Titan’s atmosphere. The batteries have enough power for the two-and-a-half-hour trip to the surface—plus an adequate reserve, in case the fall doesn’t pulverize the probe. Space exploration has always been an odd blend of millennial vision and civil-service bureaucracy, and Cassini-Huygens has seen extremes of both during its quarter-century gestation. The visionaries who got it started were inspired, in their various countries, by Voyager, which opened the outer solar system in the early 1980s and convinced space aficionados that unmanned missions could be as much of a rush as Apollo. “I remember investigators fighting for a seat at the terminals at JPL so they could look at Voyager images on closed circuit,” recalls the University of Arizona’s Jonathan Lunine. Titan, obviously reachable yet still unseen, struck this throng of scientific imaginations as a natural focus followup. Upstart ESA was raising the level of its game elsewhere too. In 1985, it showed up NASA by sending the Giotto probe to Halley’s Comet, cooperating with the Soviets and Japanese, who also sent spacecraft. The United States alone sat out the mission to Halley. “Here,” for the little disk of hope and dreams called Huygens, is two billion miles away and approaching Saturn, its computers to be awakened for one final diagnostic before Christmas, when it cuts its Cassini umbilical cord and hurtles into black space. For space veterans like Toby Owen and Daniel Gautier, “here” tends to be a restless orbit around the globe, anywhere there are ideas to be shared and plans to be laid for the next grand scheme—a lander for Jovian moons Europa and Ganymede, a Titan orbiter accompanied by balloons that could float and photograph just above the surface. Requests for interviews for this story found Huygens scientists perpetually somewhere else—the Arizonans in Grenoble or London, the Parisians at Goddard and JPL. For Lebreton and the cadre of scientists who have coddled Cassini-Huygens through the years, “here” means approaching one of the watersheds of their lives, and some disquiet can be expected. François Raulin, a University of Paris professor who is Huygens’ senior chemist, speaks for the group when he is asked what happens if the mission flops. “I don’t want to think about that,” he answers flatly. What they can do from here on to avoid spectacular (if noble) failure or assure spectacular success is exactly nothing. Charting the trajectory of a path-breaking space mission like Cassini-Huygens reveals a vivid paradox: Those who push the edges of mankind’s envelope must live by old-fashioned—certainly pre-Baby Boomer—principles of patience and dedication, soldiering on for decades in the face of technical and political obstacles, and living always with the significant chance that it won’t work—that all you will have for the best years of your life is a good, honorable try. Offsetting this insecurity, space scientists live with an old-fashioned faith: that they are part of a great venture whose ultimate success is inevitable, whether now or a generation hence.